Join the Minions on the vacation of a lifetime! Watch as a lovable-yet-bumbling Minion named Phil accidentally sinks an entire cruise ship carrying his vacationing Minion buddies. To redeem himself, Phil must turn a deserted tropical island into the perfect vacation destination. Illumination Entertainment – the creators of the MINIONS movie – and EA invite you to help Phil build his ultimate Minions Paradise. Break out the tiny umbrellas and crack open some coconuts. Phil’s turning the island into a party-paradise, and you’re invited – along with Kevin, Stuart, and Bob from the MINIONS movie. 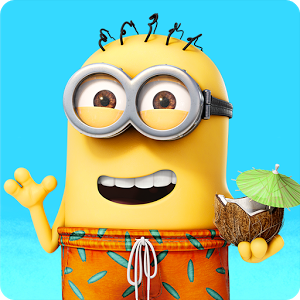 Help Phil throw incredible Minion parties and transform your island into the perfect getaway. Pass the flamethrower! Customize your island with hot tubs, hammocks, and beach volleyball courts, all with brand-new Minion animations. Plant firefly trees, harness power from electric eels, and grow bushels of bananas to make an unforgettable island for Phil and his Minion buddies.